There is a winter storm on the way, and it is forecasted to be of historic proportions. It was a beautiful Christmas, but now it’s time to put it all away. I am scrambling to get the last of my Christmas decorations and greenery taken down and stored away so I can focus on snow shoveling when Mother Nature is finished giving us a frosty layer of the white stuff. Possibly 2 to 3 feet of it. 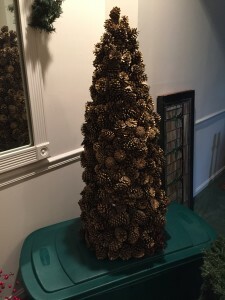 As you know, I love my Christmas things and have some really good tips for storing them so they will last for years and years. I have also come up with some space saving ways of storing them and will share a few of those tips as well. For me, I feel like so many of the ornaments remind me of long ago Christmases, friends and family members, and so keeping them preserved and safe is very important. These trunk sized bins are great for storing away long items, like garlands. For the garlands, I like the 3 foot long, trunk sized bins. Most garlands are either 6 feet or 9 feet long, so if you coil them back and forth you only need to bend them once or twice. 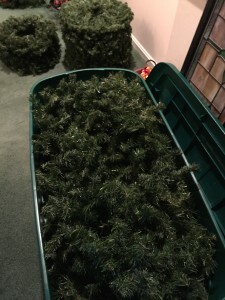 You can pile 6 or 8 of them in each bin, depending on how thick the garland is. I have three of this style bin for my garlands. They are also good for storing Christmas trees, if you have an artificial tree that comes apart in sections. 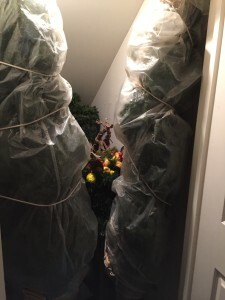 For my trees, which fold up umbrella style, I just wrap them in a plastic drop cloth and store them standing up. I like to use the boxes that my ornaments came in to store them safely. 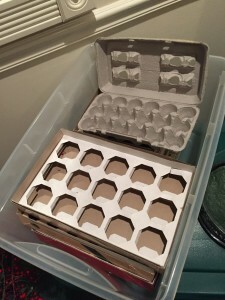 Egg cartons work great, too! For my ornaments, especially the glass ones, I recommend saving the boxes that they came in. I find that they perfectly stack in the smaller sized 2 foot long bins. (I think mine are 18 gallon size.) 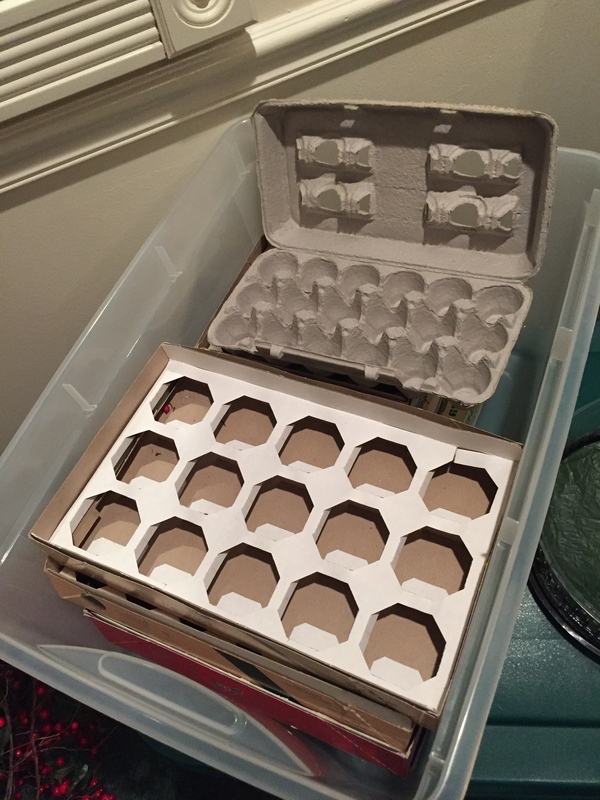 For ornaments which have no box, I reuse egg cartons, and even plastic berry containers to store them in. I have also found that shoe boxes work great for larger things — nutcrackers and candles for example. Also, I like to put one or two of the little silica pouches that come in shoe boxes with the fabric ornaments, to keep moisture away. If you flatten wreaths out before storing them, they take up WAY less space. 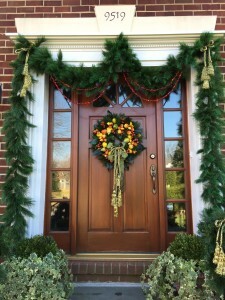 For the wreaths, I usually remove the bows and decorations before storing. I coil up the ribbon and store it with other fabric items. By doing that, it flattens itself out and doesn’t need to be ironed before using it again. (I will do almost anything to not have to iron!) I like to flatten out the wreaths and stack them. It takes only a half a minute to rake your fingers through the greenery to each side to flatten them, and they take up only a fraction of the amount of storage space that way. 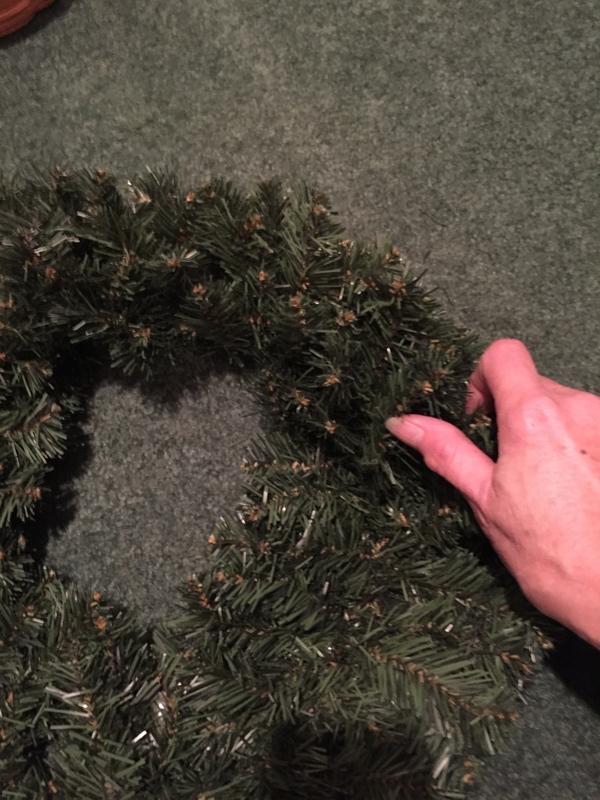 I can store 25 wreaths in the same space as 6! 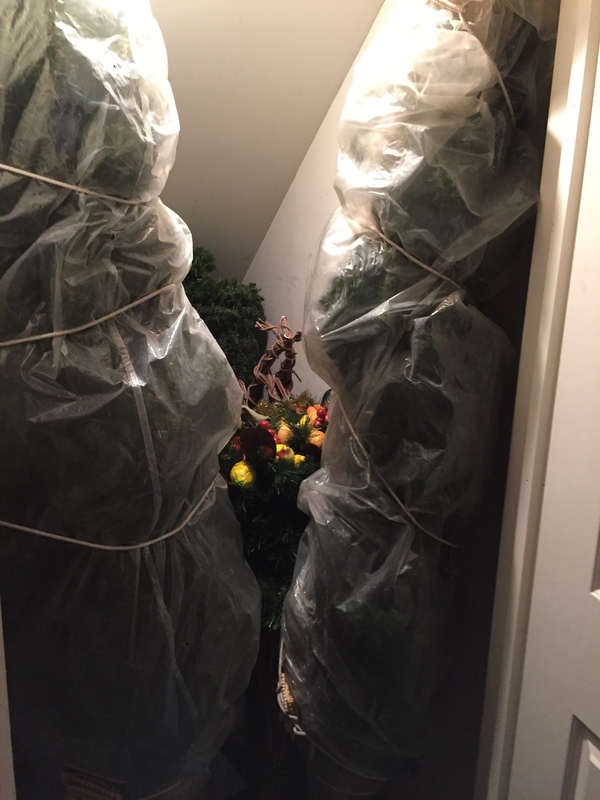 I store the trees wrapped in plastic tarps in the closet. Saves time on reassembly next year! I really like to store all of this together inside the house, instead of up in my attic, where temps can be well into the 100’s in the summer months. The heat can fade and even melt some things, so be careful what you store in your attic. This closet in the basement works perfectly, so now it’s so long to Christmas decorations until next December. 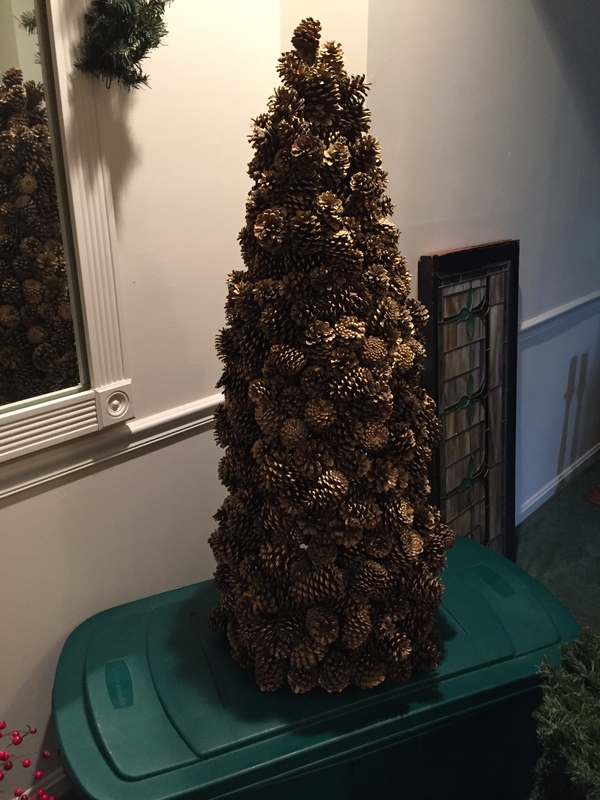 The only thing I haven’t come up with a good storage solution for yet is this pinecone tree I made years ago. It’s fairly large and heavy, so I might have to make a crate on my own. For now, I wrap it in plastic bubble wrap. Now that that’s packed away I’m going to use some lemon oil on all my tabletops. Wow, what a difference! Happy Winter everyone!